Following our customer consultation and survey of premise to determine sign type and best placement for visibility, the Spectrum team merges city code information, branding, site survey information and engineering experience to determine best practices and sign attachment method in the design stages of our project to insure a safe and successful outcome. Wall sign anchoring methods are determined by building construction, a variety of applications are used to securely affix the signs to the background. Freestanding signs require a structural footing, our engineering team determines depth of footing and size of steelwork required to meet (IBC) International Building Code standards. Sign Installation often times requires the use of cranes, aerial trucks, heavy equipment and swing stages. Our experienced installation team is held to a high standard and have extensive training to insure jobs are completed safely and correctly. Companies relocate due to expansions, mergers and logistics, A sign is an investment and in some instances can be relocated. Call us today for a consultation. Spectrum Sign Systems offers relocation services, whether our original signs or signage provided by others, the Spectrum team of professionals will evaluate the existing sign, survey the new location for placement, best method of attachment and confirm city code requirements. 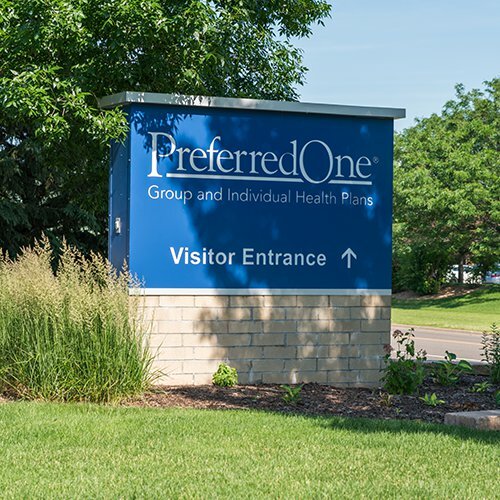 Sometimes a sign suited for one location is not a fit for another, be assured our team is always looking for the best solution to meet your sign needs. Let's help you create your new sign!